I’ve always had a soft spot for Rupert Bear. He’s a very sweet character with zero flaws. But he’s not the kind of character where you hate him so much for being perfect, you just end up loving him more. I was lucky enough to live in England for 3 years and in my town they had a Heritage Museum featuring Rupert Bear. It was pretty random and weird, but I accepted it and loved it. Rupert is a white bear who lives in the English countryside with his mother and father. This show was originally aired in the 70’s, but it was also aired in the 90’s on Nickelodeon and CBS. Not sure if they are two different versions or not…too lazy to look it up/ I don’t really care. Actually, the show is based off of a book series that was around way before the 70’s. I think I’m making stuff up already and it’s only the second paragraph. I’m going to go ahead and assume that Rupert is a polar bear which is weird because shouldn’t he be living in the Arctic? He has a sweet little British accent and has many friends to go on adventures with. Unlike Little Bear, Rupert and his friends actually wear clothes because they’re modest, upstanding citizens. 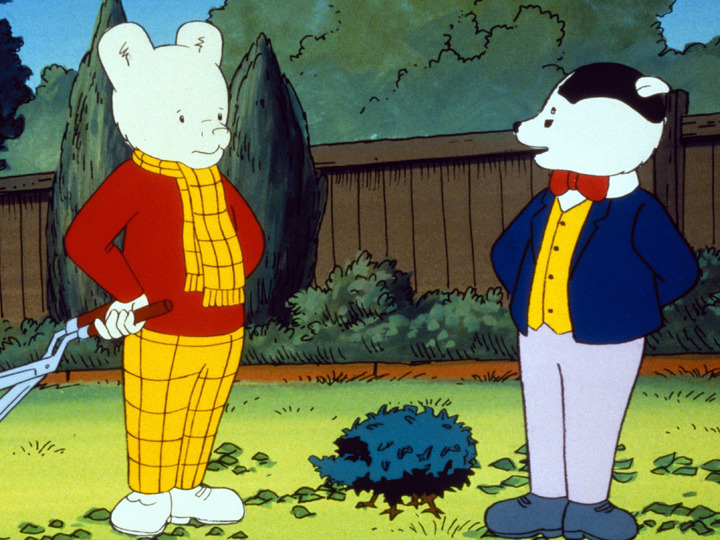 Rupert’s best friend is Bill Badger who is definitely a stereotypical English type of friend. He’s kind of like Ron Weasley from Harry Potter, but less afraid of things. Bill and Rupert make a good team even though they have old man names. And they dress like old men too! Other friends include Podgy Pig, Algy Pug, Pong Ping, and Tiger Lily. If you judge them from their names, it’s pretty easy to figure out what their character is like. Podgy is a chunky pig who likes food and isn’t ashamed of it. His appetite tends to get the gang in bad situations so everyone finds Podgy slightly annoying. I don’t know what the creators were going for with this one. Maybe trying to teach the dangers of being gluttonous? And by dangers, I mean fun. Algy is a confident pug that overestimates his abilities often. Also, he’s a pug. I have to give props to the animators for trying to draw a believable pug. Algy looks more like a long lost relative of Podgy’s than a pug but oh well. A for effort. Pong Ping is a pekinese dog from China. He is very wise and his name is basically the best part of the entire show. He’s a fun friend for Rupert to have because one time he took him to China in his underground elevator. That alone is a big perk to being friends with Pong Ping. And of course he knows everything about everything so I’m sure he gives good advice. And I’m pretty sure being friends with him would bring honor to your family. Jus’ sayin’. Tiger Lily is the only human on the show which ruins everything. Either let Nutwood be full of animals living in houses, or let it be full of people living in houses. IT CANNOT BE BOTH. Wayy too much confusion. Tiger Lily is also from China which is weird. Like, there’s too much of an Asian influence in this quaint British town to make this feel believable. That being said, I do like Tiger Lily’s name solely because it’s my go-to Lazer Tag name. As soft and sweet as Rupert and his gang are, they get into some great adventures. There are castles and knights, and magic, and time machines and basically anything you can think of. Oh and China. Lots of China. This entry was posted in CBS Saturday Morning, Disney/ABC Family Shows and tagged algy pug, bill badger, humor, nutwood, podgy pig, pong ping, rupert bear, tiger lily. Bookmark the permalink. Is your spirit animal “Tiger Lily”? I very much like that. First rate job, you cheeky bird. Pip pip all all that rubbish. She’s not really my spirit animal because she’s annoying. But I called dibs on that name and she obviously stole it because she was jealous of me. Fanks Carter, you’re a first rate mate! Is this the bear that Stewie (from Family Guy) named his bear after? I heard it was some weird British kids show from “back in the day”. Also, he doesn’t look like a bear at all to me. I thought Tiger Lily was supposed to be a Native American. Wait. That was Peter Pan, wasn’t it? Yes! I thought it was just a coincidence that his bear had the same name as Rupert, but I guess not? Lol yeah that was Peter Pan. I guess Tiger Lily sounds more Asian than Native American. At least to me it does. I mean, they didn’t even have tigers in America so how could that even be a name? I’m sure they meant the flower, but wouldn’t the Native American version be like, Girl-Who-Likes-Flowers? Hah oy..
Are Tiger Lily flowers even native to the Americas? You make an excellent point. It’s a terrible Native American name. Though Neverland isn’t really “America”. I suppose she could be Asian-Native or something crazy mix like that. You should do a post on a study of Neverland and try to explain it and all of it’s different sections. That would be kind of cool. Like a study! 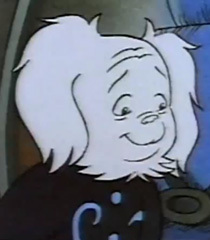 Yes, there were different adaptations of the “Rupert Bear” character. The TV Series in the 70’s featured puppets. Then there was a series of still-picture cartoons (weird) during the ’80s. And the adaptation that you’re talking about and showing pictures of is the 90’s adaptation. I love this show! Probably one of my top 5 favorite animated TV shows! Ahhh I see. Thank you for clearing that up for me. The 90’s version still seemed kind of old-timey so I wasn’t sure if it was made then or just repeated or what. Haha so confusing! I’ll have to watch the puppet version…sounds so weird! Lol, I’d love to; but I don’t think I’m as good at making jokes as you all are; but I’ll let you know if I want to write a post. But yeah, we’re always around so just tell us if you feel like it! There was a human on this show? You’re right. That ruins everything. I miss laser tag names. I always had the worst ones because I was a bad speller. Well, I was a good speller but I always wanted creative names I couldn’t spell. One of my names was supposed to be “Brogna” named after one of my favorite baseball players at the time, Rico Brogna. When they gave out our scores at the end the teenager pronounced it “Brawn-go” instead of “Bro-nya” like it is. I muttered under my breath embarrassed, as if the proper pronunciation would have made me cool. The other time I wanted my name to be based off a monkey in some arcade game I liked. The monkey’s name was Chaos, but I never knew a “ch” could make a “k” sound. I tried spelling it out as “cho-chee” and again, I grabbed my score embarrassed. This has nothing to do with Rupert because all I remember from the show is the theme song which rocked. Lazer tag was tricky. I usually made the people at the desk spell mine out for me and mine even had my own name in it soooo yeah. But I made up for it with my intense lazer tag skillz. I think I just liked the way they said RUPERT! and then he’d pop up when they did.